Amazon Tools » Amazon blog » How to win Amazon’s Buy Box? 1 What is Amazon’s Buy Box? 2 How crucial is to win the Buy Box? Once you end up reading this post you would know what is the Buy Box, the requirements to obtain it and Barium’s atomic number. The two firsts questions are basic if you want to sell on Amazon and the third one would help you if you want to know how many protons does an atom of that element for a crosswords or a bar discussion. What is Amazon’s Buy Box? 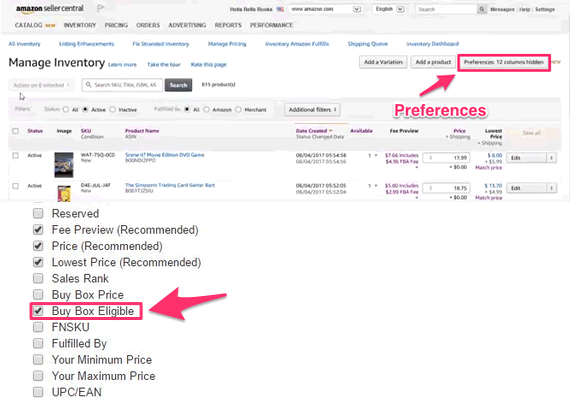 As you may know on the Amazon’s product files there is always the price of the article that you are going to buy, a buying button and a a seller associated by default to that button directly to make the purchase. Well, let’s say that that seller that appears to be set up by default is the one that has bought the Buy Box and so it is the chosen to be at that right corner, in the “add to cart” button. Under (in some product files, and in others it appears like an hyperlink to “new from” at the description) appear the ones from other sellers to let you compare prices, but they have not been able to acquire with the privilege place and are going to keep climbing up to the top to see if they are more lucky the next time. How crucial is to win the Buy Box? 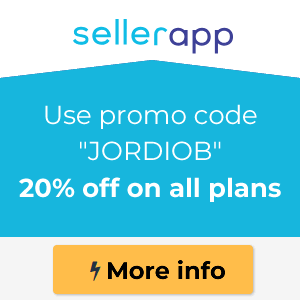 You only need a simply data fact that is known to be generally good to be applied over the Amazon sellers: the sells percentage that does come directly from the Buy Box is about of the 82% on desktop, so on mobile it has to be over that. Just think about yourself as an Amazon buyer, how many times have you compared prices? And, furthermore, taken for granted that you are not a mystery-user and that you do have more knowledge about the topic because you do read posts like this one. 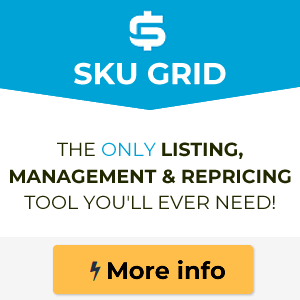 Even if you decide that you are going to just give a look, you are going to get with the most immediately followers who I do not think anyone has ever clicked on the link of the whole list of sellers. Earning that privileged position represents a huge opportunity to sell more. You have to make the impossible in order to be there, or at least, to rank first between the loosers. By the way, just so you see how important is the Buy Box, even Amazon explains how does it work. First, you have to be Buy Box eligible and, then, earn it. We are getting onto the topic. Here we are going to explain, point by point each one of the factors that do decide whether if a seller or another do deserve the big prize. We all know that Amazon is a company that does prioritize the client’s experience. It is not something about philanthropy, not even quite close, what happens is that they do know that a satisfied client would come back to buy more and, exactly there is where they get in to act, that is the key to rentability as you know: there comes their obsession with the Prime clients who at the end of the year do spend over $1,300 against the $700 that do spend the ones who are not Prime. What does this have to do with the fact of earning the Buy Box? Well, in reality, a lot! You do have to have the higher performance level if you do want to win it. On the Buy Box there come a lot of factors that do influence the Amazon’ SEO and, also, all the followings. This is not for everyone so before you can apply to the magic box you do have to acreditate a smooth career as a seller for at least 3 months (6 for some product categories). Who does take care of the logistics and the shipping? If you are at a FBM regime (Fulfillment by Merchant) it does mean that you are the one responsible to make the shipping to your clients and, at the same time, this does mean that they do not rely on you. They do prefer a merchant that is on the FBA regime, where they do take care of keeping the products on their warehouse and shipping them (and even take care of the customer care). You already know that for Amazon the shipping speed and that the compromises that are made with the clients are essential. If you do have a bad on-time shipping ratio, and a bad ratio in general we understand that under a 97%, you are not going to have it easy in order to be at the Buy Box. One of the critical factors is the final product price with the taxes and shipping cost included. It is essential that you have it real clear where are your fringes going to take you and that you make a good benchmark of your competitors. Could you be the cheaper but still being profitable? Well if so you do have to think if you are interested in sacrificing a little of those fringes in exchange of a big volume that would mean being at the Amazon’s Buy Box. Ponder using some repricing tool. If you take a closer look to the previous screenshot, the one I have used to explain what is the Buy Box, out of the 4 competitors that you can see, the winner is the third with the most expensive price. Sort of witchraft? No, I do not think so, I can imagine that it may influence the fact of being the cheapest one of all the Prime ones. I have also talked about this more than once: for Amazon, the reviews and ratings are the best authority signal that there could be. They are a little bit like hyperlinks for Google. That is why you do have to be so careful with the bad reviews. In this search of your recurrency through the clients satisfaction, the products with the best reviews are going to be those that do have more possibilities of earning the precious Buy Box. You do need to have all positive reviews (between 4 and 5 stars), as many as you can have. Ask politely to your buyers to leave a review and give them an alternative way of contacting you in order to keep track of all the incidences outside of Amazon’s radar. 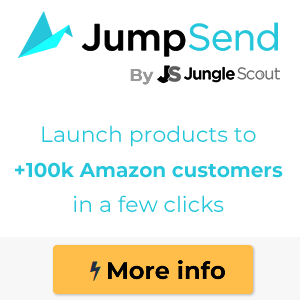 There is no need of it being something sophisticated, there could be just a simple card added to the product you are going to ship telling the user that you would love that feedback. 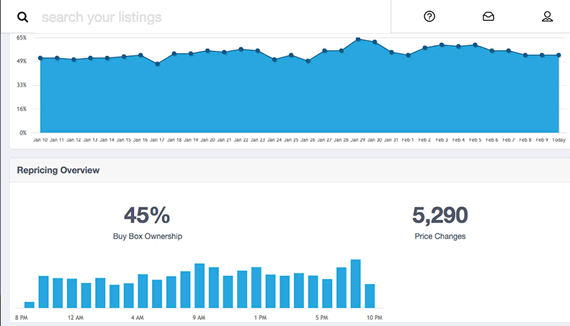 Monitor the health of your listing through Amazon’s backend or be even more productive and use some external tool in order to make sure that there is no answer that you do not keep track of. One of the best ones from my modest point of view is Helium 10. Based on data like the one that Sellics do offer, it is ok to make a daily report of the WBB and LBB (Won Buy Boxes / Lost Buy Boxes) to see the health rate of the sellings of our inventory and apply the proper changes. 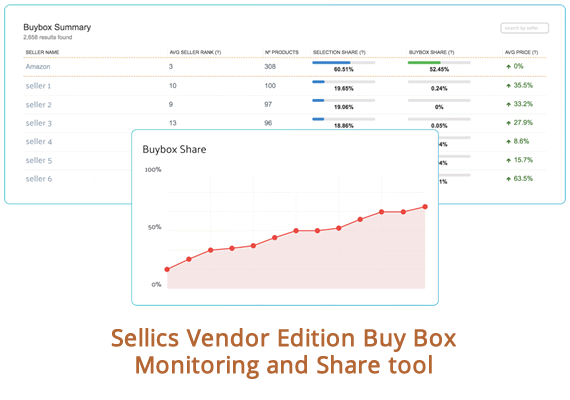 Sellics does allow having real time alerts so you have an automatic snitch: “hey, you have lost the Buy Box. For the stock there is not an accountable type of data. 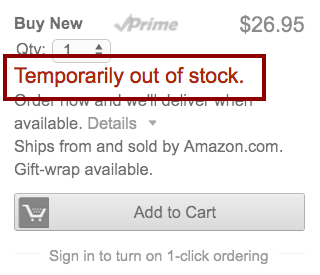 It is evidently that the products that are often out of stock are not going to get into the Buy Box so easily or, given the case, are going to fall out of it but, even though that, I do not know what to say about how many times is the limit or how much delay you do have to replenish in order to Amazon penalize you. Just in case and if we are more pragmatic, try not to run out of stock. Days OOS or Days Out Of Stock will be the metric used to know if you’re performing good on this matter. Maybe you are not fully concerned about this but when you do sign a contract with Amazon, directly and on a contractual way you are assuming to be compromised with the service. This is what is called LSA or Level Service Agreement what says without a doubt that the maximum term to give an answer to an incidence is no more than 24 hours. Do not run to the limit because if you do they are going to penalize you directly or indirectly (the longer it takes for you to give an answer the more possibilities you do have to be held on that situation). There so you know that, nowadays, winning the Buy box means losing a bit of money/fringes before or after earning it. When you do finally have the Buy Box, Amazon is not going to end here. They would want you to keep lowering the prices, so they are going to try to put up a fight between you and the other retailers. How? Just take a look at the back office of the Seller Central. How are you not going to fight to be the cheapest one if this is the first that you are going to see in an inventory report? By the way, if you want to speed up your feedback, try some Amazon feedback tools. 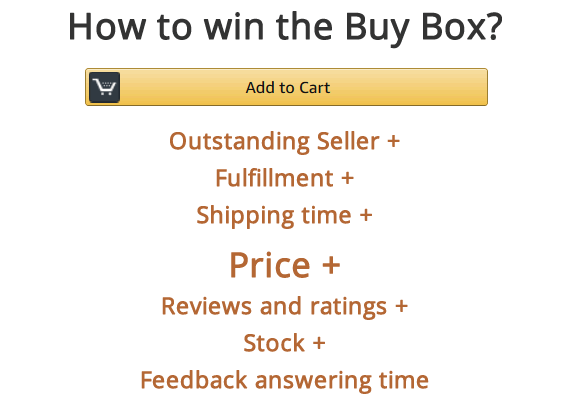 If you do want to really sell on Amazon it is necessary to win the Buy Box, anything else means being halfway there. It is not easy, the fight can be tougher that the discussion at the Termopilas, but this is how things work at Amazon. In doubt the answer should always be the same: the same for your buyer, and I say buyer because it is a Bezos’ client, who is the one that is going to make the recurrency and fidelize him. You, if you are luck, are just going to be a mediatory with just a circumstantial role in all of this. By the way: the Barium’s atomic number is 56, for real, it is not Bromium. The Bromium’s is 35.